Postpartum depression, like many mental illnesses, has a way of making a woman feel suicidal. For a person who has never suffered from mental illness, it’s almost impossible to understand why a mother would want to abandon her children in such a way. But a woman who has suffered from postpartum depression, anxiety, psychosis or other mental illness will tell you that it’s not about that at all. The misconception about mothers who are suicidal is that they are “giving up.” In reality, many mothers see it as a way to free their children, spouse, loved ones, etc., from the pain that they are causing. It is the ultimate sacrifice for someone else’s happiness. Despite what the reason is behind it – it is completely extreme and unnecessary. Any person in their right mind would realize that. Right mind being the key word here. So what is a mother to do when postpartum depression makes her feel suicidal? Untreated depression is the number one cause of suicide. Do not let postpartum depression get out of hand. I realize it’s hard to ask for help, in fact, I’ve written several times about all the reasons why mothers don’t speak up about postpartum depression, so if anyone understands, it’s me. But there’s a big difference between feeling ashamed and feeling suicidal. If there was ever a time to speak up about postpartum depression, it’s now. The only way to avoid suicidal thoughts and tendencies caused by postpartum depression is to begin a treatment plan. If you think you have postpartum depression, speak to your doctor. If your doctor is not available in the near future, or you simply don’t feel comfortable speaking to your doctor about it for whatever reason – then try contacting your local public health nurse, find a therapist or mental health center. And if all else fails, head to an urgent care center or the ER. But don’t give up seeking help just because your doctor isn’t available, there are so many other options available. If you don’t get the help you need, keep looking. It’s sad that I even need to include this as an option but it’s so common for women with postpartum depression to get brushed off by the health care system. If you’re told that “it’s nothing” or “it’s just sleep deprivation” or “this is normal motherhood” and you truly don’t agree – then get a second opinion. If you’ve exhausted all your options locally, then consider finding treatment online or over the telephone. Online therapy can be extremely beneficial and convenient. There are several other resources available online, in-home and over the phone, so there is no excuse for avoiding treatment. “They would be better off without me” should be the slogan for postpartum depression considering how many women have said it, myself included. Postpartum depression is notorious for reducing a woman’s self-esteem and sense of self worth. This opens the door for suicidal thoughts. To make matters worse, others often tell us things like “don’t worry, you’re a great mom” or “you should give yourself more credit” thinking that they are helping, when really, it just invalidates our feelings. In order to see your life as worth living, you need to focus on how you feel about yourself. Consider all the things that you once loved about yourself, and that you will love again. Like your ability to win arguments or make people feel comfortable around you. Maybe it was how others came to you for fashion or love advice. These are things you can look forward to again when you get the postpartum depression under control. Make a list of some of your best qualities. Do you have the best smile? Great hair? Eyes that sparkle? Or is it your excellent sense of humor or party planning skills? What makes you stand out among the rest? Think of a time that you made others laugh, or helped someone who was hurt. You have the power to affect another person’s life in a way they may never forget. Try surrounding yourself in positive images or create a self-care sanctuary that you can escape to when you’re feeling low. Look at pictures of some of your happiest memories, vacations or family holidays. What would those pictures look like without you in them? There would be a big empty hole where you belong. Scroll through old Facebook or Instagram posts and remember who you were before postpartum depression. You have changed, and it’s unlikely you will ever be the same person again. But it helps to remember who you once were and know that your life is just as important now as it was then. Maybe we’re not the ideal mothers we thought we would be, but no one ever is – even the ones without postpartum depression. The truth is, our children would much rather have a sad mother around than no mother at all. No, not a suicide plan. A plan for the future. It’s hard to imagine a future when you’re in the depths of postpartum depression, but I promise you – it’s there. Each climb that you take upwards out of the deep, dark pit of despair brings you closer to the light. And if you can see the light – even if it’s just a tiny speck like a distant star in the night sky, then you can climb towards it. That tiny speck of light is your future and the higher you climb, the closer you get to a brighter future. Having a plan can remind you that the future does exist. Set realistic goals with dates to achieve them by. These can include things like finishing a book or learning a new skill. Try to avoid putting things like weight loss on there as those are almost impossible to achieve and can be discouraging. Make a bucket list. What are some things that you’ve always wanted to do before you die? It doesn’t have to be the usual big ones like skydiving or cliff-jumping. Think of anything and everything you’ve ever wanted to do in your lifetime and put it on the list. Create a self-care schedule. Self-care is the latest buzz word these days, and there’s a good reason for that. Mothers need to make time for themselves otherwise bad things like suicidal thoughts can happen. Schedule yourself some time to take care of yourself and don’t put it off. Postponing things just for you signal your brain that you are not as important as the other things happening around you. Bonus: Check out the post: How to Create a Self Care Routine as a SAHM and download a free self-care workbook! Meet with a financial adviser. No, not to “get your affairs in order” but rather, to make a financial plan for the future. Find out how to save and manage your money to make sure it will last. Financial problems can cause a lot stress and suicidal behavior. Having a financial plan for the future can help you feel more prepared for the road ahead. You can start getting your finances organized by downloading a Finance Tracker kit from Shine Sheets. Suicidal tendencies are only one of the many nasty symptoms of postpartum depression. Women also have to deal with postpartum rage, intrusive thoughts and a whole slew of physical pain as well. Even with a treatment plan in place, it is likely something that mothers will have to battle their entire lives. 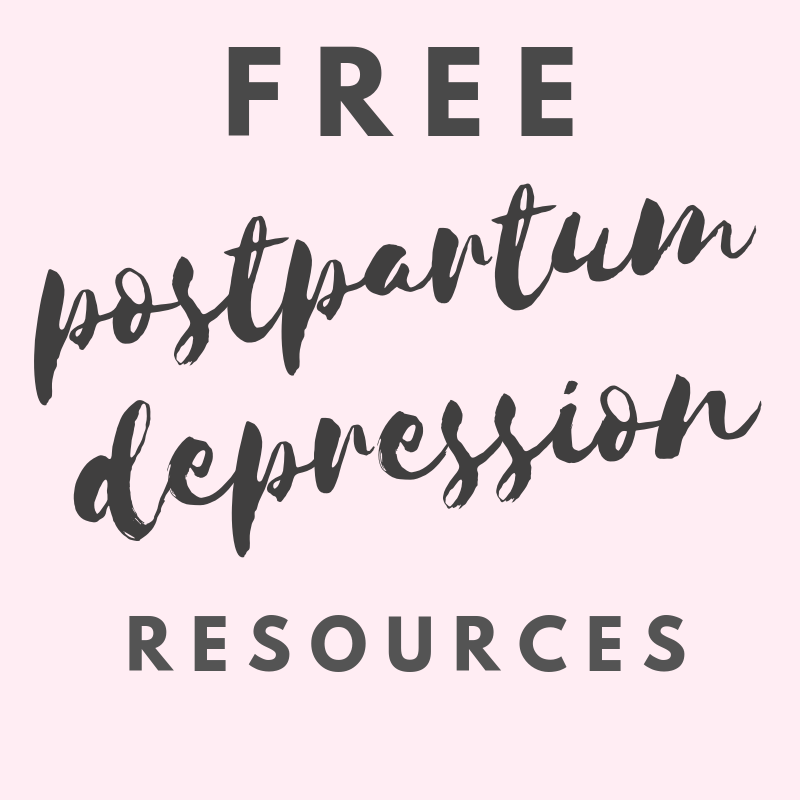 The key to keeping postpartum depression symptoms under control is avoiding the things that trigger it, such as stress, illness, sleep deprivation or the winter blues. Since it’s impossible to avoid triggers 100% of the time, it’s important to follow your treatment plan and make sure you are open about what you’re feeling with your loved ones. Recruiting help to manage your symptoms and triggers will make sure that you continue down the right path. If you are struggling with suicidal thoughts, it’s important to talk to someone about them. When someone commits suicide, those closest to them often swear that they had no idea what they were going through. Don’t let that be you. You have several options for who to talk to if your postpartum depression is making you feel suicidal. Your closest person. This could be your spouse or partner, a sibling, friend or parent… whoever you feel the closest to and most comfortable with. They are often the best person to tell first, because if they have been paying attention to your behavior – maybe they already suspect that someone isn’t quite right. A therapist. Therapists are trained to handle situations where people feel suicidal. They know what to say and what not to say. They also understand where the feelings stem from and won’t judge you for expressing your feelings. Online therapy is an option worth considering if you’re worried about the trouble of finding a therapist and making appointments. A support group. Sometimes all we need is a sounding board and someone who can relate. Joining a postpartum depression support group, whether in-person or online, is a safe place where we can open up about feeling suicidal and not be condemned for it. Many mothers have been there too and will gladly give you advice or encouragement. A crisis center. Crisis centers are designed specifically for handling emergent situations where you feel like you have no where else to turn. Many of them have the ability to dispatch help locally if they feel it is required (similar to calling 9-1-1). But they will also listen to you and provide you with advice and resources. Or – you can talk to me! I’m here to help, after all. I’m a stranger who doesn’t know anything at all about you except that I have once been there too, so I will never judge you, ignore you or invalidate your feelings. In fact, I would treat you exactly the way I wished someone would have treated me when I needed them to. I DON’T have any formal medical training but I DO have access to a lot of resources that I would be more to happy to share with you. Suicide is not a choice that a woman with postpartum depression makes, but rather something that happens to her. It’s the result of an illness in the brain that tells us lies and forces us to attack our own bodies. Women with postpartum depression are exhausted, chemically imbalanced, overwhelmed and in physical pain, so when the brain sneaks in and whispers “just end it” – it sounds like a good idea at the time. I hope, with every fiber in my being, that you find your true worth and value, remember that you are loved and cherished and know that suicide is not the best option.